The reason I decided to go with this deck is because I expected the tournament to be a lot of aggressive decks, which it was, only two people used control decks, everyone else focused on attacking. One of this decks best match up is any form of rush deck. I played against two of them, on being Light/Fire and the other being Light/Nature, utilizing the new Shaman of the Vigil promo card. I was able to win both matches swiftly because I can turn 5 Blinder Beetle Prime and turn 6 Cobalt, the Storm Knight. This deck can also be good against control because I can get my progression and if I utilize cards like Tar Gusher and Keeper of Laws, it is difficult for control decks to keep up. This deck worked just the way it was designed to. I am going to go more in depth and take a look at cards and why they are significant and why I chose to use them and why I chose not to use other cards that might seem good. This card has not seen much play after Dragonstrike Infernus was released. A lot of people pushed this aside after Andromeda of the Citadel came out. My friend Robby Stewart built a control based Enforcer deck using it and it worked very well for him and that is where I got the idea to build this deck from. 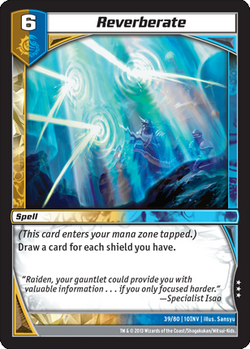 I like this card a lot right now because many people are using Tempo/Aggressive decks. Not only do you gain a shield, but Cobalt also has 6500 power, and that is very significant. Throughout the whole tournament I was able to attack over Blinder Beetle Primes and Lyras with that extra 500 power. 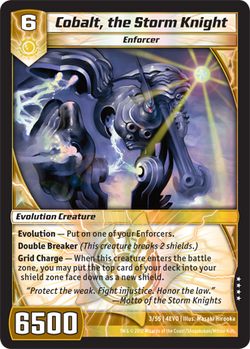 Blinder Beetle Prime is one of the most popular evolution creatures right now and that is pretty much the sole reason behind using this card. This card is definitely underrated right now and I expect it to see more play. I did not just use this card because it is an Enforcer, its ability is simply amazing, I would probably use it even if it was not an Enforcer. The fact that you tap a creature whenever it is banished makes it very versatile. It does not just have to be banished by battle, if they Bone Blades it, tap a creature. It is also a slayer so whenever it battles a creature, you can banish the creature it battles with and then automatically tap another one. I abused the tap ability a lot in the tournament. Another big reason I used this card, which you will see a lot, it is the Blinder Beetle Prime Destroyer. 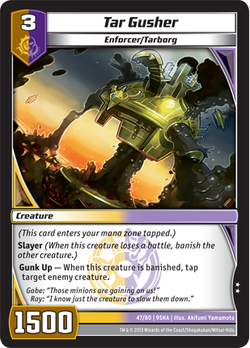 If I have this out and my opponent plays Blinder Beetle Prime, it doesn’t even faze me because if they choose to attack with it, I can banish it with my Tar Gusher because it is a Slayer. I also used it many times late game with Stormspark Blast to banish Andromeda and Eternal Haven many times. It also gives you a little bit of freedom against blockers as well. You can attack to just banish a blocker, if they choose to block, and then tap another blocker. This is by far my favorite creature in the whole deck. I originally had two Rusulka in this deck, but I was not finding much use of bouncing, most the time I had a Tar Gusher or Blinder Beetle Prime in the Battle Zone I could utilize so I chose to run the old Blinder Beetle over Rusulka. This helped combo my deck out more and give me more bait for my evolutions. It was also fun when I had eight mana and could play Blinder Beetle, tap a creature, and then evolve it into Blinder Beetle Prime, tap another creature, attack with Prime, tap another creature and use it as a mini board wipe. This was just a tech I used to help defend myself against Gilaflame really. If I get the right hand, it is also a nice early aggressive card. I used it as that additional push against aggressive decks. With 5 mana I am able to play Chasm Entangler then evolve into to Sparkblade. I got one for entering the ARG Circuit Series so I figured why not? I tested out Dark-Seer and I just did not like it. It is a really good card, but not right now. It is not that great against aggressive decks and it being turn 4 just made it awkward for most of my progression. It also encouraged me to be more aggressive than I like to with this deck. I decided to use Lost Patrol instead because it was a turn earlier and has 500 more power. I know a lot of people might disagree with me but Dark-Seer honestly did nothing for me when I tried it out, but just because it did not work for me does not mean it will not work for someone else. When I played against dragons they just throw down Herald of Infernus and I liked that I could use Lost Patrol to deal with it as oppose to Dark-Seer. I chose not to use Lyra for a couple reasons, one being I already have a lot of tap cards in my deck, 2 Blinder Beetle, 3 Stormspark, 3 Blinder Beetle Prime, 3 Piercing Judgment, and 3 Tar Gusher. I also have a lot of bounce cards in the deck which does the same thing, if not more. The other reason is because I did not want to get clogged up with too many high cost cards in the deck. I wanted to focus on the early game in this deck, which is another reason I did not use Dark-Seer as well. I was already using 11 cards that cost 6 or more mana. Once again, I built this to go against aggressive decks and Cobalt on turn 6 is more effective than Lyra would be. There are only two changes I would make to the deck after using it. I would take out Sparkblade Protector for one Andromeda of the Citadel. Sparkblade is great and all but it is just a gimmicky card that did not perform that well. Andromeda would have helped me in my top 4 match against Megabugs because we took it to late game all 3 games and I would have had a much easier time if I used an Andromeda. The other change would be taking out one Logos Scan for a Reverberate. I did not think I needed Reverberate because of 3 Logos Scan and 3 General Finbarr but I played against a control deck using a lot of discard and struggled. It is probably good to use 1 of this card in every deck using Light/Water just for those moments when you might need it. This is one of the most fun decks I have played in a while and I had a great time at the ARG Circuit Series. It was nice using Cobalt again because one of my favorite decks from Kaijudo was Cobalt Control in 4EVO format. 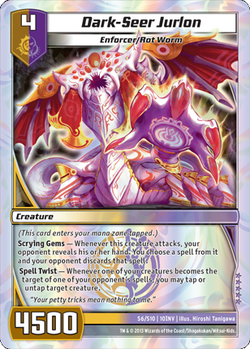 In these next couple months I am going to working hard on building new decks because the possibilities are endless, which is the best part about Kaijudo. Let me know what decks you come up with or you have a deck idea you would like to see me build I can try my best to put it together and maybe right an article about it. You are a fantastic player and show excellent sportsmanship as well. Our team had a blast at ARG St. Louis. If you are ever in the southeast Missouri are be sure to drop into 1Up Game. We have Kaijudo every Saturday night at 8PM and have 15-25 players on average play every week.